A couple of years ago my husband and I completed a huge renovation of our kitchen. 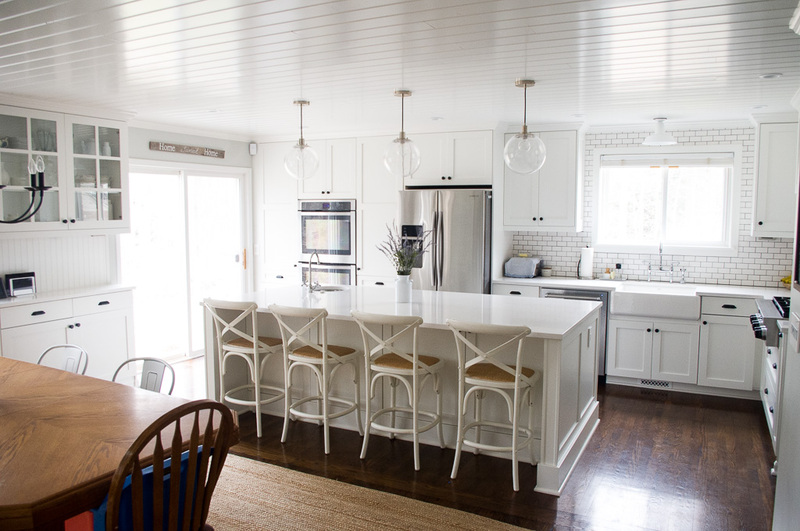 So today I want to share with you the 9 lessons we learned during our kitchen renovation. Here is the before picture. It is super dark and it is the only picture that gives you a good sense of the space. The kitchen was behind that wall, separated from the rest of the main floor. At this point, you can actually see some of our new appliances sitting in the corner, next to the fridge. 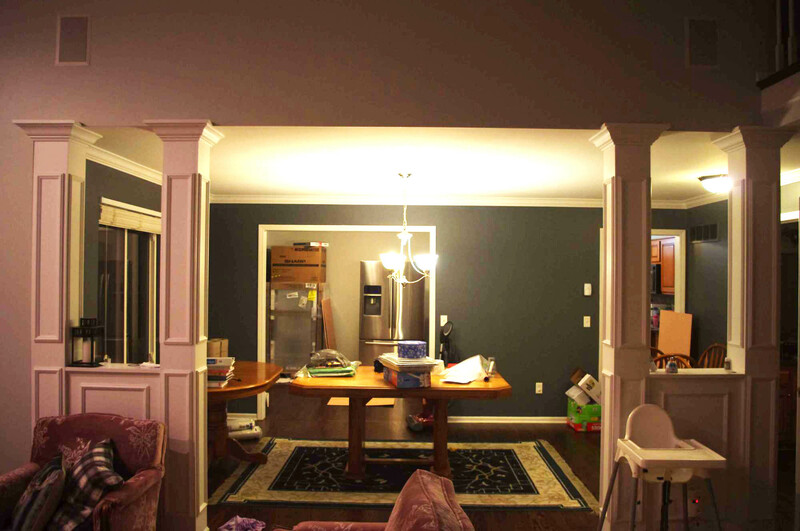 We wanted to open up the area by taking down the wall that is dividing the kitchen and dining room to make the whole main level feel really spacious and inviting. Read to the end to see the after! Remove a load bearing wall. We used a structural engineer to help with all of those details. Fix the HVAC systems that ran through the load bearing wall. Move laundry downstairs to create a larger mudroom. Fix all the hardwood floors. Rip up old tile and re-tile mudroom. Add tongue and groove planks to the ceiling. Assemble our custom RTA cabinets. Have a plumber install sinks. Put all the cabinet hardware on. Here are the 9 Lessons we learned during our kitchen renovation. 1 – Take your time in the beginning and do lots of research. Before we started the kitchen renovation I spent at least 8 months of planning, planning, and more planning! This was because we decided to be our own general contractor (see lesson 2). A kitchen renovation is one of the biggest projects you can do in your home! 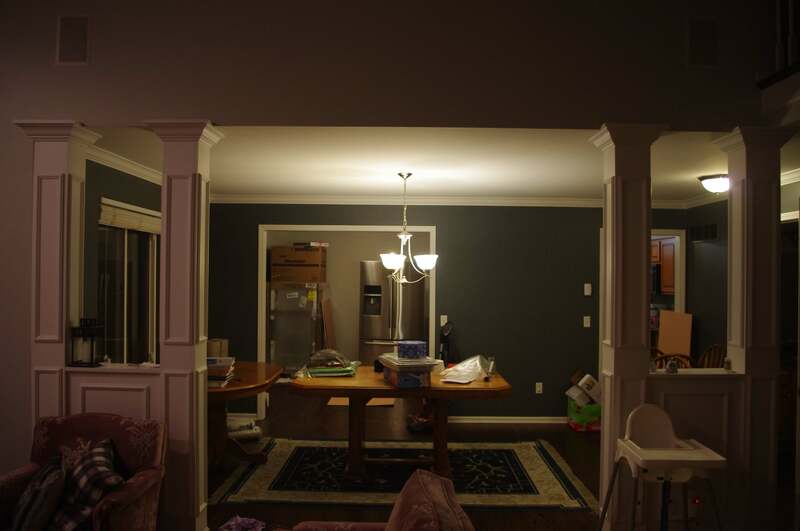 I planned the demolition, fixing a load bearing wall, picking out fixtures, designing the layout of our cabinets, lighting plans, work triangles, timelines, budget, and all the finishing touches. Of course, I had to do all my work at night or during nap time, so that also might be why it took awhile. I know that sounds like a lot of time and you might be able to do it quicker, but that is just how long it took us to plan and then finally start the project. This step is the foundation and will make sure your project runs smoothly. The longest part of the planning was the design of the kitchen cabinets. We used Barker Cabinets, which are custom RTA cabinets (ready to assemble), to save money. They are solid wood and super amazing quality. And I would definitely recommend them! However, taking all the measurements and picking out which cabinets we wanted to go where and inputting that all into the software he offers is a bit tedious and not for the faint of heart. There is quite a steep learning curve, but once you get started you get the hang of it pretty quick. Thankfully my husband has a really good eye and attention to detail, so before we ordered we double and triple checked everything. Before we were ready to start a project we would get at least 2 – 3 estimates from different contractors or tradesmen. This way we were making sure we weren’t getting taken advantage of and it also acted like a mini interview. We were able to see how they handled quoting out the job (did they provide enough information), did they have a good attention to detail and were they interested in the project. If you get a bad feeling from the start, or just feel uncomfortable about the person you are hiring, no matter how low the bid. Keep looking and trust your gut! We also had a few larger kitchen design companies and general contractors come out and give us a quote for overseeing the entire project from start to finish. But, we ended up being our own contractor and hiring out and DIYing the work ourselves to save us thousands of dollars! Which leads me to my next lesson. 3 – Make a realistic budget. The dreaded budget. I lived in this budget for a long time during the planning phase. Researching how much everything costs, getting estimates and picking out everything. It is really important to plan out everything the best you can upfront. I had a working excel sheet that was updated when a purchase was made or a contractor was paid. This way we could see what we had budgeted and then what we actually paid for everything when all was finished. When something ended up costing more or less I could adjust items that weren’t bought yet to “play” with the budget and ultimately save us money and stay on budget. Budget is everything. I had categories for hardware store trips (for those random tools and supplies you might need, but did not expect), appliances, cabinets, plumbing, electrical, cabinet hardware, lighting, fixtures, flooring, labor, etc. 4 – Shop the sales. If you have the time and space, start shopping before you start your renovation for sales. We purchased our double ovens and pull-out microwave drawer, during a Black Friday sale, almost a year before we started the kitchen renovation. I also purchased our sink and commercial cook-top as well when they went on sale. We just kept them in a corner of our house or basement until they were installed. It was annoying but so worth it in the end because of the money we saved. 5 – Sell your old kitchen. You know that saying: “ones mans junk, is another man’s treasure.” Well, that definitely applies here. We were able to sell old light fixtures, our cabinets and countertops, and our old appliances. Any extra money you can make is great! 6 – Demolition is fun, but it takes time. After all the planning is done, you’re ready to make a few holes in your walls. 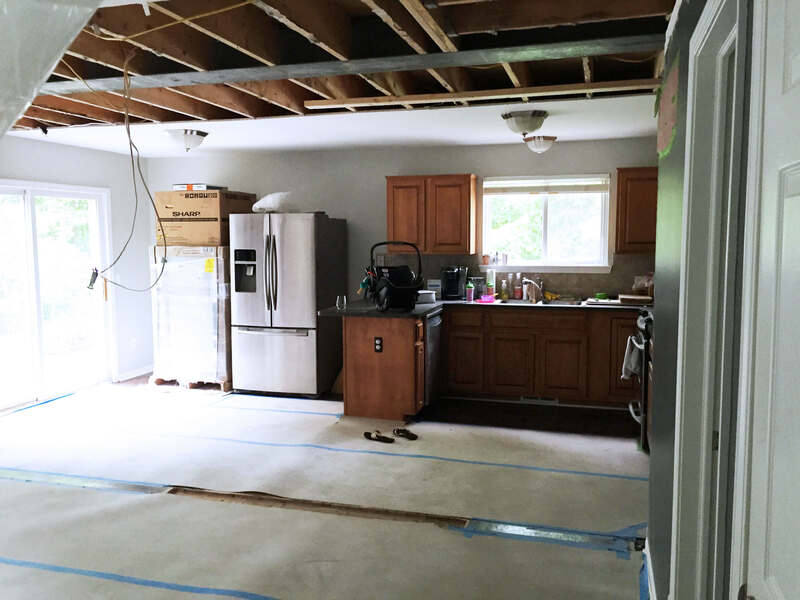 We removed a load bearing wall, cabinets, appliances and, part of the ceiling to install a beam. But not all in one day. We didn’t get rid of the existing appliances until the last moment, as it was the only way to cook our dinner. In order to save money, we completed all the demolition ourselves. But it takes time and you have to be careful not ruin what you are leaving in the area you are renovating. It took us a couple of weeks to remove everything and then we had the contractors install the beams and poles to support the house after removing the load bearing wall. 7 – Living during a renovation is no joke. It’s exciting to be working on your home and making it more inviting, but there are definitely downsides. Especially when doing a kitchen renovation and you don’t have any appliances for months! Unless you go with a turn-key company who can complete the job quickly. Once our old appliances were sold, I cooked with a Coleman stove, toaster oven and washed all the dishes in our half bath sink for a long time. Our refrigerator sat in our living room along with our table, couch and all of the girl’s toys. It was tight, to say the least. And it was also stressful, but ask anyone who has lived through a kitchen renovation or any renovation and they’ll most likely tell you it was worth it in the end. And yes it really was! 8 – You don’t need a professional designer. If you are willing to put in the work, you can save yourself a lot of money by doing the designing yourself. Of course, you have to have an eye for design and should enjoy the process. There is a ton of information on the internet to use in your design planning. I relied on lots of other bloggers who had already completed kitchen renovations and followed their design choices. One really great one is Jenna Sue’s Kitchen Chronicles. She kept track of everything and shares all her resources. I also used Pinterest for inspiration and Houzz for their great forums. Like I said in lesson one planning is the most important step and this goes along with that. 9- Be patient and enjoy the process. My last lesson is to be patient. It’s going to be stressful at times and there will be mistakes along the way. But with patience and a positive outlook, it will all come to an end and you will have a beautiful inviting space for your family to enjoy. 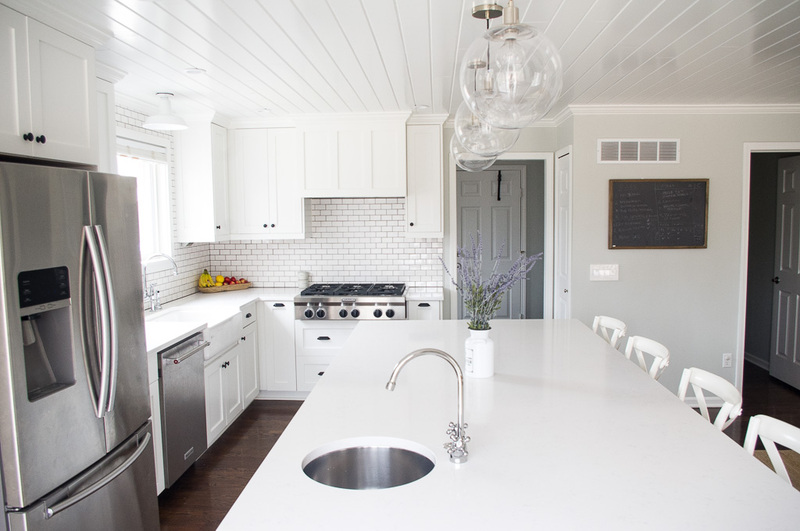 I hope that these 9 lessons we learned during our kitchen renovation will help you! Let me know if you have any questions and check out these posts as well about our kitchen!